Are you required to do mandatory overtime at your hospital? In Ohio, lawmakers are trying to ban mandatory overtime as a condition of employment. 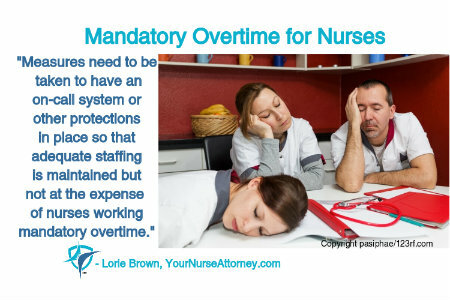 Nurses are very scared that if they say “no” to mandatory overtime that they will be fired. Due to the nursing shortage, hospitals feel they have no choice but to have nurses work longer hours to cover more shifts. But, unfortunately, this creates a danger to the patients and to those who care for them because the nurses will be exhausted. Interestingly, Ohio was the state where a nurse was killed in an auto accident when she fell asleep at the wheel after working mandatory overtime. Her husband filed a lawsuit against the hospital. It is sad that laws need to be put into place to make sure nurses are not working unusually long shifts. Laws are in place that limit work hours for airline pilots, truck drivers and others. Nursing should be one of those professions with limited work hours. Minimum mandatory staffing would go a long way, however, under such a directive, hospitals may require having nurses work over to fill that minimum requirement. Minimum staffing requirements were recommended to improve patient care but, if nurses are working longer hours to fulfill that minimum mandatory requirement, then that is not helping patients because the nurse will become exhausted. Measures need to be taken to have an on-call system or other protections in place so that adequate staffing is maintained but not at the expense of nurses working mandatory overtime. What are your thoughts? Does your hospital have mandatory overtime? Please let me read your thoughts in the comments below. Yes, a 65 year old nurse was fired for refusing to work mandatory overtime. Mandatory overtime has gone on for about 5 years at my hospital. The place I work in Ohio is often short staffed. As one walks into shift, there is bombardment of “We really need you to work a double” how can anyone work a double when she or he were not prepared? Then be expected to perform all duties error-free. The number one concern is the patients safety. The documentation in electronic medical record application Point Click Care is another waste of valuable time. The Nurse Managers are to pick up the slack (team work), however will be On Call over phone at home; rarely do the nurse managers or any of the other nurses working in offices come out to assist the Charge Nurse. It is simply mentioned pass the work along to next shift. Really? Spend 2-3 hours completing the work of prior shift, afterwards then start the duties of the shift one is assigned to work. Then to hear a Nurse Manager state “We had it harder” is an objective statement which makes one want to vomit. The patient care today 2018 is more complex. Then there is the concern of the Director of Nursing telling the Charge Nurse that the work must be done during scheduled shift; (remember above pass it along?) we need everyone punched out no later than 30 minutes at scheduled off time, and all work completed. A much needed time study would be ideal. Possibly changing the medication times according to position in unit. Either way working as floor nurse can be chaotic, the focus needs to be more on the care of the patient, prevention empowering each patient to do as much for self as he or she can. I agree. The work is so much harder and the standards are so much higher. No wonder why more and more nurses are getting into trouble because it is almost an impossible standard. thanks for sharing. I do believe age discrimination exists especially if you are one of the higher paid nurses. How do you contend with or prove age discrimination? It’s very difficult to prove “age discrimination,” but we all know that it’s quite prevalent and out there. Rarely do I read about organizations looking at ways to retain the seasoned nurse at the bedside. In a previous role in a large free standing Urgent Care one of the big complaints by providers was that during the lunch period of 1-5pm there is a dramatic decrease in productivity. Of course there is, unless additional staff is covering the holes left by lunch time. I offered to work 4 days per week, 12 to 6:00 pm to maintain higher productivity, ensure supplies/equipment orders were completed and generally ensure the unit was ready for the onslaught of post work and school visits. My supervisor was agast at the idea and wasn’t even interested in sending it up the chain of command for comment and/or a trial period. Short sighted nurse managers are the bane of any type of innovative thinking or action. I work in a Prison infirmary – the inmates come to recover following hospital stays – also for TX for symptoms not severe enough for hospitalization but too ill to stay in their cell. Other stuff too – it’s like a 10 bed med/surg witH lots of psych mixed in. We have mandatory OT every paycheck BUT ITS SCHEDULED. I do 4 12’s one week and 3 12’s the next alternating with my partner. I’M 65 and I LOVE my schedule. I am so glad your schedule is working out for you. I know there are some good environments in nursing. Each unit and facility have their own culture. It’s finding the one that works for you.